Successfully Added USB Modem - HSUPA Modem For High Speed Internet Via SIM Card to your Shopping Cart. 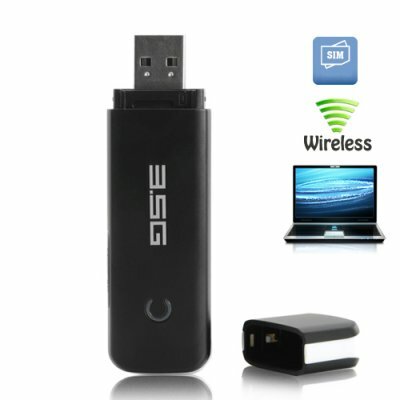 HSUPA Wireless USB Modem for high-speed wireless internet on your laptop computer. With download speeds of up to 7.2Mbps, you can enjoy browsing the internet, emailing your friends, and chatting online, all at speeds comparable to public Wi-Fi hotspots. No matter where you are in the world, you can connect to the internet on high-speed UMTS networks or even use quad-band GSM/EDGE/GPRS networks. Simply put, wherever you have cellphone signal you can access high speed internet! In addition, there is a micro SD card slot for the convenience of storing your media and work files, or can simply be used to transfer files from one computer to another. Setting up and using this HSUPA wireless modem is quick and easy too. Just slip your SIM card into the modem and connect the modem to a free USB port on your computer. Your computer will detect the modem and begin installing the software from the USB stick automatically. If you own a laptop, netbook or notebook, then ensure yourself you will always be able to access the internet by ordering this HSUPA Wireless USB Modem today. This USB modem is fully backed by our 12 month guarantee and is in stock now and ready for next day shipping. Available only from the leaders in wholesale electronics, Chinavasion. The software has preset configurations for networks all over the world and will locate available networks in your area automatically. You can also manually configure your network and connection settings. The user friendly interface makes configuring your network and managing your SMS messages and phone book quick and easy. What is the difference between HSDPA and HSUPA? They are both fairly similar. The main difference is that HSUPA is newer and faster. HSUPA has a slightly higher average download speed when doing tasks on the internet. However, the key improvement is that the upload speeds are much faster. The faster upload speed is useful for tasks such as uploading files, picture messaging, video messaging, video chatting, or music messaging. When you connect the CVQZ-K93 Wireless Modem for Laptops, Notebooks and Netbooks to your Windows PC, the software will install directly from the modem without having to use a CD. This makes it more convenient to use the device on different notebooks and netbooks, ensuring you have maximum mobility without sacrificing functionality.